CAIRO — Nearly one year after some of the largest demonstrations in Egypt’s history drove dictator Hosni Mubarak from power, the country’s revolutionaries are resigned to the idea that revolutions take years, and that theirs is far from realized. Eve Radwan, 24, participated in last year’s demonstrations, and although Mubarak is on trial, she and many others believe that the military council that has officially ruled the country since Mubarak’s departure has no intention of giving up power. Since March, more than 12,000 civilians have been subjected to military trials and the military has engaged in deadly repression of dissenters. The generals who make up the Supreme Council of the Armed Forces, many of whom served under Mubarak, had initially said they would transfer power to civilians within six months before suggesting that it might be as long as two years before presidential elections were held, prompting widespread demonstrations in November demanding that the military hand over power to a civilian government without delay. “The revolution will continue, definitely. There’s no way to go back. There are people who have lost children, there are people who have lost their eyes. What are we supposed to do? Everyday we lose one of us,” Radwan said on a sunny day in December after riot police and the military attacked a sit-in in front of the country’s parliament building, pelting demonstrators with rocks from the top of the parliament and other buildings nearby. Tahrir Square, where last year’s demonstrations took place, is once more the center of revolutionary violence. The names of the streets that lead to the square have become synonymous with violence as security forces have repeatedly clashed with demonstrators during the last year, using tear gas, live gunfire, rubber bullets, pellets and rocks. Scores have been killed and thousands have been injured. “Before the revolution I was planning to leave Egypt, to study in France. 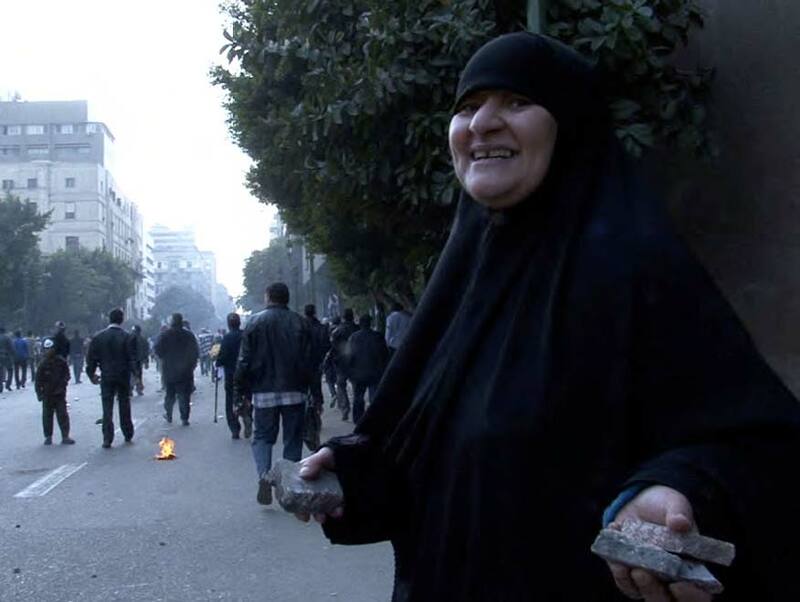 But this is my country,” Radwan said as security forces pelted demonstrators with rocks in the street behind her. The military council has resorted to building walls to keep anti-government demonstrators in Tahrir Square from blocking the parliament and cabinet buildings. Concrete barriers have also been erected on Qasr al Aini, a major thoroughfare in the capital. It is largely instances of police brutality similar to those that sparked the demonstrations last January that have brought people back into the streets. “The people in the square want justice for those who died today and yesterday. The shooting began at night, when there was no coverage from the media,” said one demonstrator after a night of violence in November when four others were killed by live rounds. “Today will be just like yesterday, but there will be more demonstrators, and more will be killed. Sometimes counter intuitively, the violence of the last two months has taken place against the backdrop of three rounds of parliamentary elections, which so far have been dominated by religious political parties, most notably, the Muslim Brotherhood. Under Mubarak the party was officially banned but tolerated as the only real opposition to the regime. Two days before the second round of voting in November, party loyalists rallied on the west side of Cairo. As the Brotherhood supporters walked through narrow streets of a neighborhood called Ard al Loaa, chanting party slogans and handing out flyers, “real Egypt” was on display. Most Egyptians readily recite the statistic that 40 percent of the country lives below the poverty line. Part of the Brotherhood’s popularity comes from its decades of charitable works, but the residents of these small streets appeared unimpressed. The Brotherhood appears to have taken the majority of the vote, followed by a Hezb al Noor, an ultra-fundamentalist Salafi party that is more religiously conservative than the Brotherhood. What remains to be seen is whether the military will actually hand over power. Spokespersons for the Brotherhood have said they believe the military is sincere in its promise to hold presidential elections by June, but disagreements remain over the process of writing a new constitution. In past months, the party has declined to support the ongoing demonstrations. The Brotherhood’s years of being somewhat tolerated as an opposition party make it, in the eyes of some, part of the felool, or remnants of the former system. Many Egyptians voted for the Salafists because they are thought to be the least corrupt, while others support the Salafists’ call for the immediate imposition of strict Islamic law. Election campaigning and coverage was long on bombast — including promises from Salafi candidates to end alcohol consumption in the country — and short on actual discussion of party platforms and proposals. The Brotherhood has a detailed platform that includes plans for reforming of the Ministry of Interior and the police forces that prompted so many Egyptians to take to the streets, but it is unclear to what extent they might be allowed to implement such proposals, or if the party itself is cohesive enough to do so once in power. The initial months after Mubarak’s departure demonstrated the party is not monolithic, with some members forming breakaway parties. But the Brotherhood has been preparing for this moment for decades and is loathe to let it go. The last round of elections, held under Mubarak in 2010, were marked by fraud and intimidation. In Alexandria, the country’s second largest city, people waited patiently outside polling stations under umbrellas as it rained off and on into the afternoon on the first day of voting. At midafternoon, before an announcement that voting would be extended countrywide until 9pm, some lines were still hundreds of persons long. Egypt has not had a free election in more than 60 years, and Adel, an English teacher, echoed the sentiments of many others as he stood in line to vote. Many Egyptians appeared ready to give elections a chance, hoping that the new parliament might find a way to effect change. Hazem Hilal is a candidate with Kotla, a grouping of mostly secular parties that appeared to be posing the greatest threat to the Brotherhood’s dominance. Even before all the ballots had been cast, Hilal was thinking about organizing for the next round of elections, though it is unclear when those might take place. Kotla members have painted the election campaign as a contest between secular and Christian Egyptians and conservative Muslim parties. But for many, the battles are still in the streets rather than at the polling stations. The surest sign Egypt’s revolution remains unfinished is Maspero, the state television and radio building. Perched on the Nile River, the building has been the site of demonstrations against Egypt’s government, including one in October in which more than 30 people were killed, some brutally decapitated when they were run over by Egyptian Army armored personnel carriers. 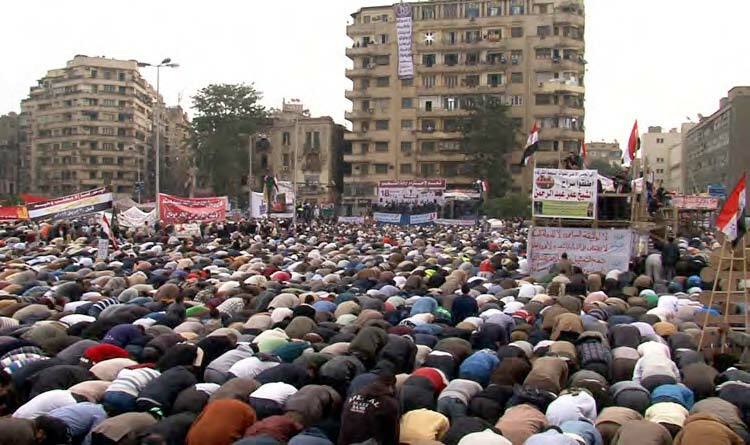 Maspero has continued to broadcast official lies while Egyptian demonstrators are cut down in the street. Nonetheless, the messaging seems to be well targeted — a number of Egyptians readily believe the government’s assertions that the revolutionaries are foreign-funded, intent on undermining Egypt’s sovereignty and delivering it to outside powers. 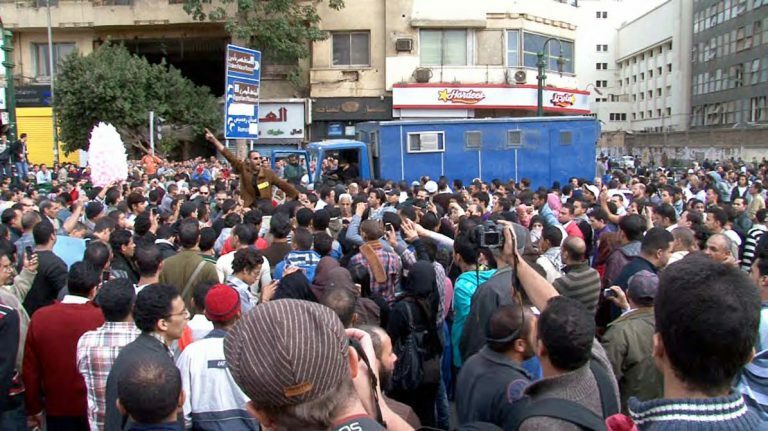 For many, the police state led by Mubarak is still in place. Just as security forces held demonstrators at a makeshift underground prison beneath the Egyptian Museum, a downtown landmark, after the anti-Mubarak demonstrations that began last January 25, demonstrators in November and December were held underneath the parliament building. Milad, a volunteer doctor at the Omar Makram Mosque, one of the three field hospitals near Tahrir, said the hospitals have been raided regularly, and doctors and patients have been arrested. March, were mostly men who had been injured during what Egyptians refer to as the January 25 Revolution. Among them as well were relatives of some of the nearly one thousand people who were killed by security forces in January and February before Mubarak stepped down. One of those injured was Alaa, who came from Qena, about 10 hours’ drive south of Cairo. The Brotherhood, meanwhile, patiently waits for its time to come. David Enders has covered Middle East politics since 2003. He is the author of Baghdad Bulletin: Dispatches on the American Occupation. Formed after last January’s revolution, the Mosireen video collective produces videos that have helped illuminate what’s happening in Egypt in the face of a government-led propaganda war (See main article). Beginning this summer with Tahrir Cinema in Cairo, Mosireen has held regular public screenings that have taken place in 15 of the country’s 27 governorates. The screenings draw a cross section of Egyptians, and almost inevitably spark heated debate. Mosireen also trains people to make short films, how to live stream, and how to get what they see on the streets onto the internet and out to the world. The collective’s YouTube channel, which allows mobile downloads, has received hundreds of thousands of views for some of its videos of police and army brutality against demonstrators. Lobna Darwish, one of the collective’s six core members, recently spoke with The Indypendent. INDY: Why is video so dangerous to the government? DARWISH: There is a propaganda war. It’s been Mubarak’s tool and then their tool since I was born. It is one of the most powerful tools to make people delusional, to make people apathetic, to make people distrust each other. That’s why we needed to create our own media, the people’s media, revolutionary media. It’s very hard to change the language, it’s very hard to change how people think. When you don’t see with your own eyes, you have to be shown. A lot of people know but pretend they don’t know because they can’t deal with the pain of it. But you have to be forced to see it, then you can do what you want. INDY: What thoughts do you have as the anniversary the revolution approaches? DARWISH: There is a revolution taking place in Egypt, but most international media doesn’t deal with it that way. They tell the story of a revolution that took place in 18 days and then there are clashes with the army. No. There is a revolution taking place, revolution is a very long road, not just in Egypt but everywhere. Some places are more advanced than others but we’re all trying, and not only is the Supreme Council of the Armed Forces able to have this propaganda campaign inside Egypt, telling people that these people in Tahrir are thugs, but also international media is helping this campaign without intending, by telling this fairy tale of 18 days and then success. Mubarak was not the goal, the people wanted to topple the regime, and we will go on fighting until we get it. For more information, see mosireen.org.